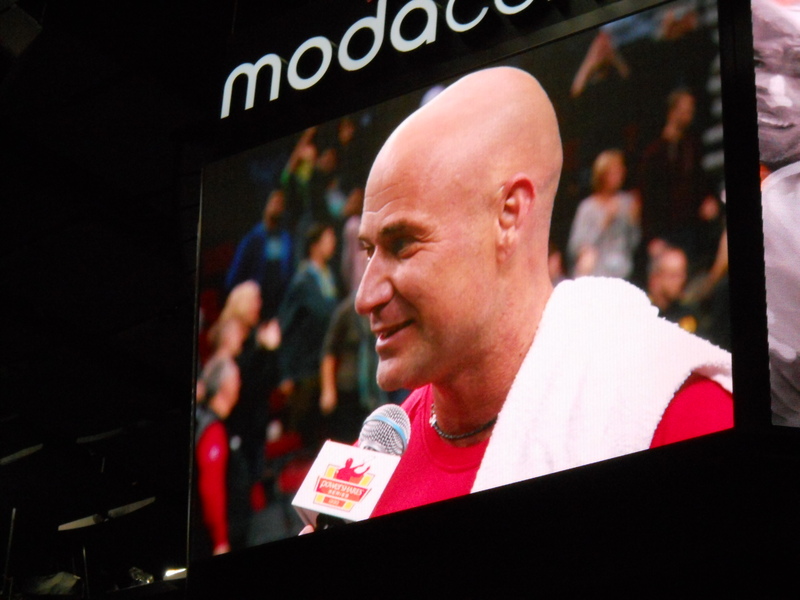 Portland tennis fans had a rare treat Thursday night at the Moda Center when four retired players including John McEnroe and Andre Agassi stopped by for a charity tournament. The PowerShares series is a 12-night event featuring American tennis stars over thirty. 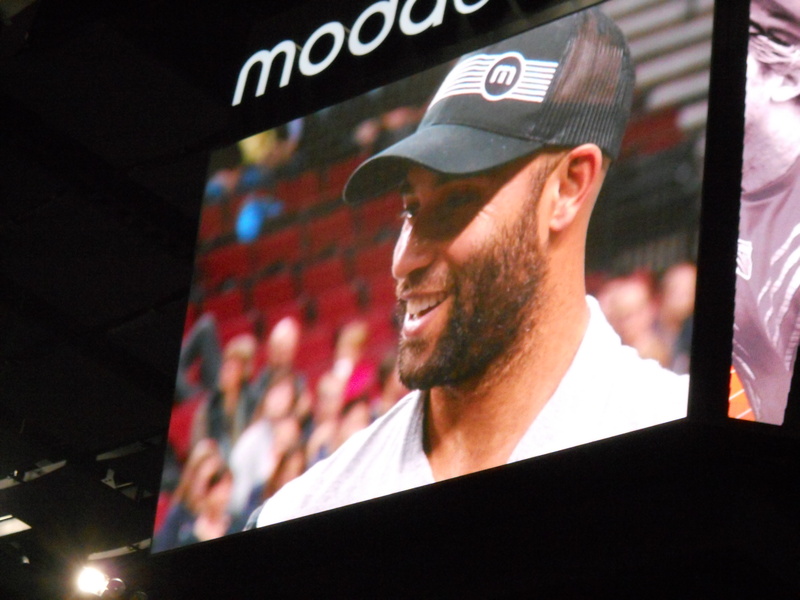 In addition to Agassi and McEnroe, the Portland stop, the ninth this year, featured James Blake and Jim Courier. Portland doesn’t often host tennis events of this caliber. The last time we had anything close was in 2007 when the Davis Cup Final was held at the Memorial Coliseum. While The Power Shares series doesn’t come close to matching the prestige of the Davis Cup, Thursday night was still a very big deal for Portland tennis fans, and it was something we don’t see here nearly as often as we would like. Nike, the ubiquitous shoe brand, has been very good to tennis, and by extension, so has Portland. No Nike-sponsored player made it as big as Agassi, who splashed onto the tennis scene in the early 1990s. His charismatic style, combined with aggressive marketing by Nike using his image, helped to bring a new, larger audience to tennis. Just when John McEnroe was nearing retirement,Agassi, along with contemporary Pete Sampras, seemed to pick up the torch, beginning a new era of Americans dominating the scene. I had my own pair of Agassi Nikes, white with purple trim, when I was ten. I don’t know if they made me a better player, but they sure looked cool. The year I got my Agassi Nikes, 1992, was also the year Agassi won Wimbledon, often considered the grandest of the grand slam tournaments. At the time, he was the first American to win the title since John McEnroe had last won in London in 1984. He would go on to win all four grand slams at least once, a feat unmatched even by Sampras. Thursday night was a one-day tournament featuring three, single-set matches; two semi-finals and a final. Game one featured James Blake and Jim Courier. While Courier is the more accomplished player, he was no match for the younger, quicker Blake. Next came Agassi versus McEnroe. Even at the age of 55, McEnroe is fast and a formidable opponent for Agassi. On Thursday, however, Agassi, the 90s favorite, was at the top of his game, advancing to the final round to face Blake, the youngest player in the tournament. While the previous two nights saw Blake take the final round, Thursday belonged to Agassi. This was the first time I had been to a professional tennis event, and I was not disappointed. From my ninth-row seat I was treated to first-hand greatness. I’ve been watching the pros (including these very men,) play on TV since I was a four-year-old boy. But to see them perform in person is something else altogether. Though I knew to expect this from seeing it on TV, it is almost disconcerting to be at a sporting event where the crowd applauds after a play-disconcerting yet delightful. The fans relished seeing these legends, especially Agassi and McEnroe, compete live. And the players, for their part, loved the opportunity to still compete and dazzle the audience, post-retirement. 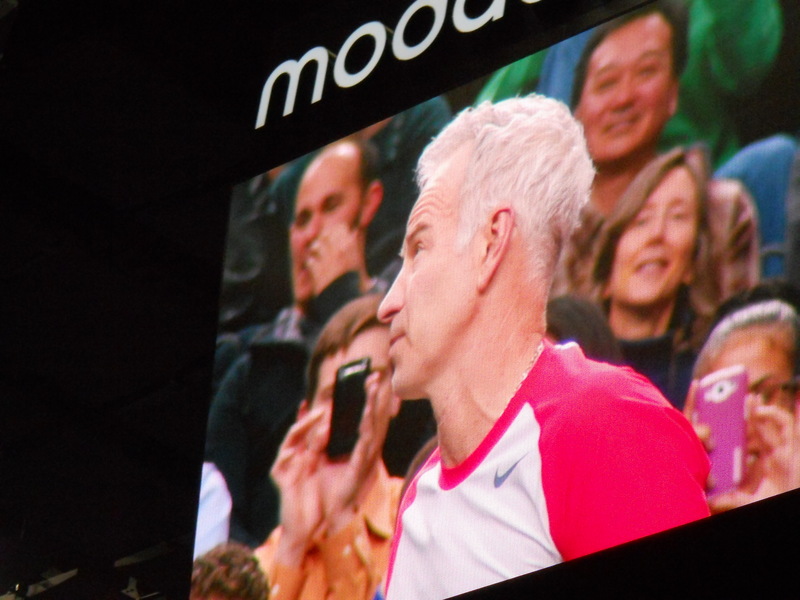 McEnroe brought his famous flair for arguing with the umpire, and even throwing his racket at one point. Would the crowd have wanted it any other way? Agassi, for his part, was ever the gentleman-genuinely modest, and unfazed by the ugly taunt from an audience member, or by his courtside interviews with the slick Brett Haber of the Tennis Channel. Thursday night’s event was a love letter to Portland tennis fans, and the love was reflected right back at the legendary men on the court.